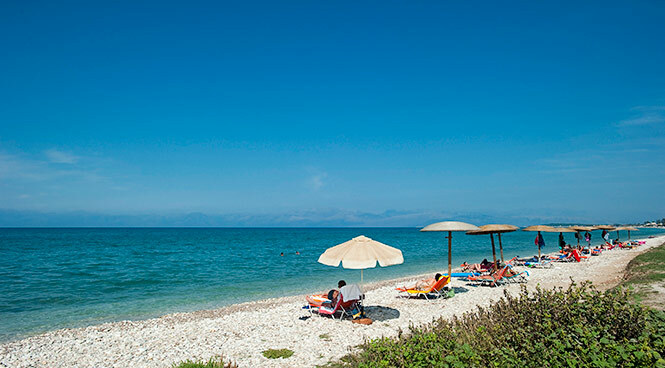 Roda is located on the far North Coast of Corfu, close to Acharavi. The resort was once a small fishing village but over time has been built up to form a large traditional resort, popular with families. Many of the restaurants have entertainment and live music and you’ll find everything from traditional Greek tavernas to English cafes. The main town runs alongside the beach which is made of sand and pebble, with clear shallow water. For anyone wanting to see more of the island, Acharavi is only a short drive along the coast, or you have the opportunity to explore by sea by hiring your own boat!Roda is located on the far North Coast of Corfu, close to Acharavi. The resort was once a small fishing village but over time has been built up to form a large traditional resort, popular with families. Many of the restaurants have entertainment and live music and you’ll find everything from traditional Greek tavernas to English cafes. The main town runs alongside the beach which is made of sand and pebble, with clear shallow water. For anyone wanting to see more of the island, Acharavi is only a short drive along the coast, or you have the opportunity to explore by sea by hiring your own boat! The pleasant resort of Roda has grown over time to form one of the larger resorts on the island. Although the resort has a number of contemporary Greek tavernas offering live entertainment and music, a small selection of more traditional older buildings from the original fishing village can still be found. You can also find a choice of souvenir shops as well as mini markets for your daily shop. The resort centre is right on the coast, running side by side with the beach – a mile-long stretch of sand and pebbles with clear, shallow water, ideal for swimming and snorkelling. Anyone wanting to see more of what this beautiful Ionian Island has to offer will find the resorts of Sidari and Acharavi, as well as Corfu’s highest point, Mount Pantokrator, all within a short drive.